Not Just Another Mother Blogger! : My Teen-Aged Self Was Kind Of An Idjit. My Teen-Aged Self Was Kind Of An Idjit. 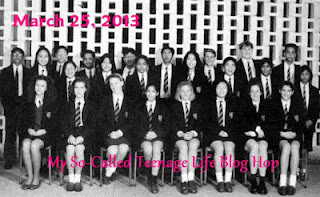 My So-Called Teenage Life Blog Hop. Sounds fun, eh? I used to keep a journal back then, but I can't even tell you where the heck it went. It is likely in some box, shut off from the light, being slowly eaten by rogue silverfish. And the truth is that that journal was full of horribly emotional and dramatic prose, dripping with angst. I remember that for at least three years I wrote about how I had an enormous crush on a poor boy named Tyler. I never actually ever spent any time with Tyler, mind you. He was a nice young man--athletic, blonde, and Nordic, but I had this entire romance created in my head that had absolutely nothing to do with him. That's what I wrote about in my journal, all about how this imaginary Tyler was going to notice me and sweep me off my feet and it would be, like, the most awesome romance in the history of romances. I would be cool by default! What happened after that was a little blurry, of course. I mooned over him from afar, finally saying something to a friend. Being a teenager, she promptly told everyone on the planet, and Tyler, who had no interest in me, went a little overboard in announcing his rejection. I decided that he liked being with the cool kids, and didn't want to lose his standing. Then my journal was full of mournful despair, "woe is me, nobody understands the depth of my heartbreak" mixed in with hopeful asides, such as "Oh my God! Tyler asked me for a pencil!!! He really cares!!!" Yeah, I was emo before anyone else even thought about it. I had lots of those sorts of secret crushes, on random boys who knew nothing about me or my adoration. Boys named Chad and Carl and Neil, worshiped from afar. I think that was sort of the point--once they knew that I liked them, I seemed to lose interest. The dream was much more preferable than the reality. Even then, I wasn't too keen on commitment. I was also awkward, uncoordinated, and incredibly naive about the world and the people in it. Most of what I knew about relationships came from books, like the Harlequin romance novels that my mom would get free and bring home, or the Louis L'Amour novels that my dad collected. Not exactly realistic versions of courtship. My innocence in matters of the heart also meant that I usually had NO idea that a guy liked me at all until they flat out said so. Then I would be completely flabbergasted at the idea that any boy would look at me and be interested. What the heck was wrong with them, that they liked me? Yeah, I was a hot mess. 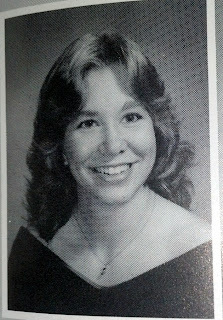 Yep, I found my yearbook! If I could talk to my teenage self right now, I would tell her that under no circumstances should she even think about cutting her own hair. I would say that she should find a girl named Michelle and hug her, because she would be a lifelong friend and a wonderful influence. I would say that she should tell the boy, whoever he was, how she feels instead of keeping it to herself. I would advise her to take chances on the boys who worked up the courage to tell her how they felt. I would tell her to avoid the red hair color and any semblance of a mullet. I would tell her to hire a math tutor once she got to college, and to minor in business and computer science instead of English. Also, teenaged self, stay AWAY from the trash can punch. Really. And no more than two tequila shots in an evening, girl! Stick to beer--you're germanic, you can drink beer like water. Okay, head over to Andrea's and join her hop!!! Hahaha, my whole teenage life was just one big cringe - weirdly, the angst you describe was no stranger to us teenage girls downunder!! Maybe teenagerism is a scary disease?? But I don't think I could have coped with being a teenager AND being on FB, Twitter etc! THAT'S scary! Oh teen Tina! Teen Andrea could"ve absolutely understood your heartbreak over fabricated romances! I wish I would've had more guts in high school too. Taken a chance or too. Oh well. What teen girl hasn't had a fabricated epic romance in her head? 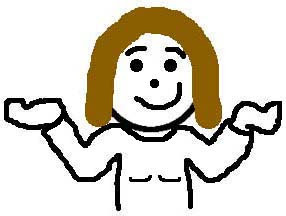 Even today I think I'm permanently friend-zoned, since very few men have ever been interested in me as more than a friend and one of the guys. At least I genuinely had no interest in dating in high school or even college, so I was spared the humiliation of telling a guy I liked him. Ah, but you were a FUNNY hot mess & still are! (the funny bit, not the hot mess part). I'd offer you a pencil if I could!